Some Leather or Family Alcyoniidae corals periodically slough-off a thin top layer of tissue. This shedding process is not a regenerative action, but one that serves to rid the coral's surface of accumulated waste, debris, and algae. Once a coral has shed what could be described as a layer of "old skin," it's not unusual for it to appear larger and more magnificent than before. Sarcophyton, Lobophytum, and Sinularia species leather corals are those that regularly go through this shedding process, as shown in this sequence of Toadstool Mushroom Leather Coral pictures. By using the clam in this first picture as a gauge, you can get a general idea of the width and height of the coral before it shed. 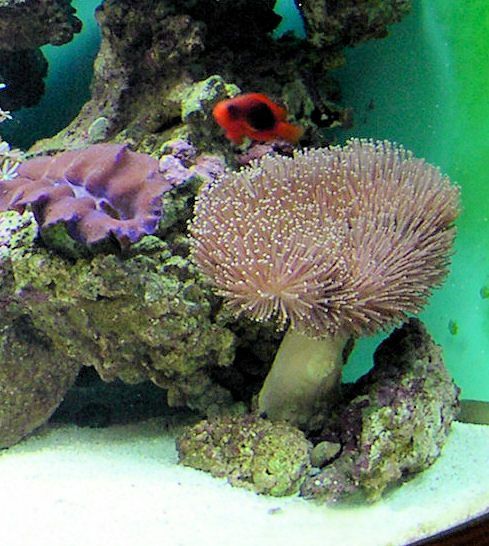 This photo shows how the Toadstool Mushroom Leather Coral looks several days after performing a simple cleaning procedure of the substrate in a 92-gallon reef tank. It was determined that due to the amount of fine sediment that was suspended in the water from stirring up the sand, and periodically blowing water over the coral with a turkey baster to remove any debris that settled on top of it, caused the coral to respond and go into the shedding mode. It should be noted that we had a Diamond Watchman Goby (Valencienna puellaris) in the tank, which constantly sucked up and sifted the sand in the tank, spreading it all over everything, including the corals. In the first phase of shedding, the coral closed up and shrank, and the surface took on a waxy appearance. The coral remained in this stage for several days before it actually started to shed, as seen in the next picture. 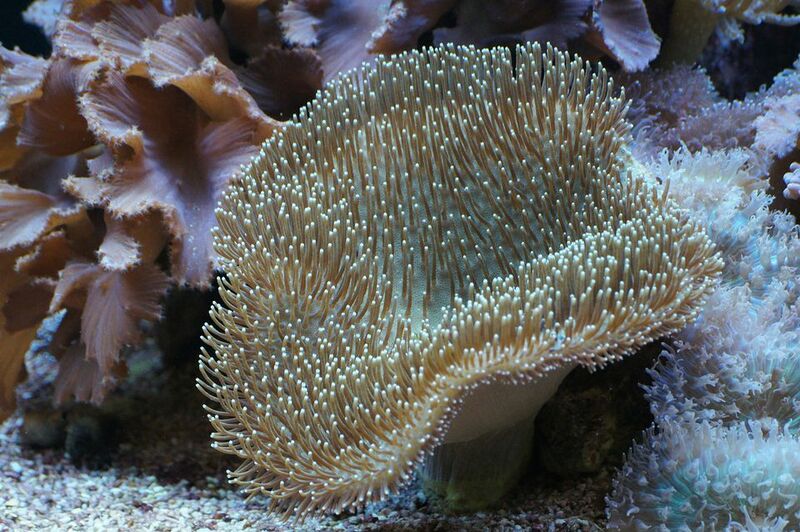 In the second phase of shedding, here you can clearly see a thin, slimy-like membrane peeling away from the surface of the Toadstool Mushroom Leather Coral. In the area where sloughing already occurred, the coral's polyps started to come out again. This and the next picture were taken about an hour apart. The Toadstool Mushroom Leather Coral continued to shed its outer layer, and in this second phase picture compared to the previous one taken, you can see how the area of shedding widened by looking at where more polyps had emerged. This transition progressed until the coral had completely rid its top surface of "old skin," and as the last photo shows, the coral was fully rejuvenated. From start to finish, the complete process of the Toadstool Mushroom Leather Coral shedding its "old skin" transpired over about a seven day period. This picture shows the coral in its full splendor after shedding. Once again using the Tridacna crocea clam in the photo as a size gauge, and comparing it with the first photo shown, you can see the end result. The coral is larger and even more magnificent than before.